The StroboFlip VS-F Virtual Strobe Tuner is a great addition to Peterson's line of multi-temperament tuners, offering easy-to-use functionality in a flexible new design. 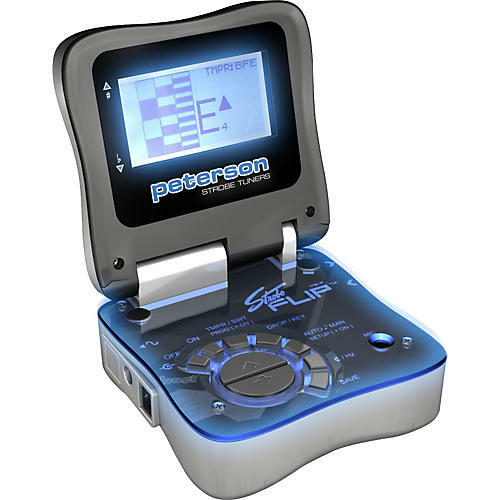 It uses Peterson's exclusive Virtual Strobe Technology to provide an instantaneous picture of musical pitch. It gives you a compact flip design, large bright LCD, and full user programmability. The StroboFlip is perfect for intonating guitars and basses as well as realtime intonation practice to improve performance and listening skills. It features cent offset, FTS drop tuning, and tuning assistant and comes with tempered tuning presets, some of which have never before been included in a tuner. In addition to Peterson's proprietary GTR temperament, which sweetens a guitar's tuning, the VS-II adds BAS, which does the same for basses, plus E9 and C6 tempered presets for pedal steel and lap steel guitar. The StroboFlip also supports the Buzz Feiten tuning system. The Bass Shift feature allows for effortless tuning of acoustic or electric bass down to 2 octaves below a normally tuned low B on a string instrument.